Hebridean Island Cruises was formed in 1988 when then former 1964-built carferry Columba was bought from Caledonian-MacBrayne and rebuilt into a cruiseship for cruises around the Hebridean Islands and the Scottish coast. She started her cruising at the 26th of may 1989 as Hebridean Princess and firstly retained her cardeck, so passengers could leave at any port they wished. Two years later, the cardeck was rebuilt so her passengercapacity could increase. The company seemed to operate well, because in 2001 they aquired another ship, this time a very luxury cruiseliner from Star Cruises, their MegaStar Capricorn. MegaStar Capricorn had been built in 1991 at the Nuovi Cantieri Apunia wharf in Italy as yardnumber 1145. The ship had a tonnage measurement of 4280 and a passenger capacity of 114. he crewcapacity was 72, so it is clearly visible that she was a very luxurious vessel. The ship has a lenght of 90,60 meters, is 15,30 meters wide and has a draft of 3,95 meters. Her speed is very modest, just 15 knots. She was built for the company Renaissance Cruises and was part of a class of eight. Within this class, the first four were slightly different from the last four, of which this ship was built as a second member. The naming of the ships was not very elegant or thoughtfull, the first ship was built as Renaissance I, followed by Renaissance II, III and IV. This naming was continued in the second group of four. Our ship was built as the Renaissance VI. She sailed her first cruise for Renaissance in october 1991, being small she was able to reach ports that were unable to reach for the larger cruiseliners. Because of the success Renaissance was getting out of this, the company decided to built another eight replacement ships that were far larger then the original ones. This also caused the first ships to be sold off, in 1998 Renaissance VI was sold to Sun Cruises for whom she recieved the name Sun Viva 2. Sun Cruises also bought one of her sisters, the Renaissance V that was renamed Sun Viva. Renaissance Cruises started to sail with the new ships from this year onwards, the very elegant R-class. Again, the naming was not that innovative, these ships were named R One, R Two and further to R Eight. It was not just the naming strategy that as a problem for Renaissance Cruises, because the company collapsed in 2001. In 2000, Sun Viva 2 was sold to the Maleysian company Star Cruises that renamed her MegaStar Capricorn. But this again was for a very short while, because she was again sold to Hebridean Island Cruises in 2001. For them, she was slightly rebuilt, renamed Hebridean Spirit and her passengercapacity was brought back to 98. She was officially named at Leith, Scotland by the Princess Royal alongside the former Royal Yaught Britannia. Hebridean Island Cruises was going to use this ship for other cruises then just around the coast and islands of Scotland, she was also seen in other parts of Europe and even outside Europe. But after this aquisition, Hebridean Island Cruises came into bad weather. Firstly, the company was renamed Hebridean International Cruises in 2006 so that the cruises from the new ship were better covered. In 2007, the majority of stock of the company was bought by the Stonefield Castle Group, who decided to sell the Hebridean Spirit on very short notice in the spring of 2009, bringing the company back to its roots. This had to be done because of the downturn in the economic climate. The ship was sold on the 7th of april and one day after, they went into administration. Within three weeks, All Leisure Group stepped in and bought the company, renaming it Hebridean Island Cruises and making a new start with only Hebridean Princess, the first ship. 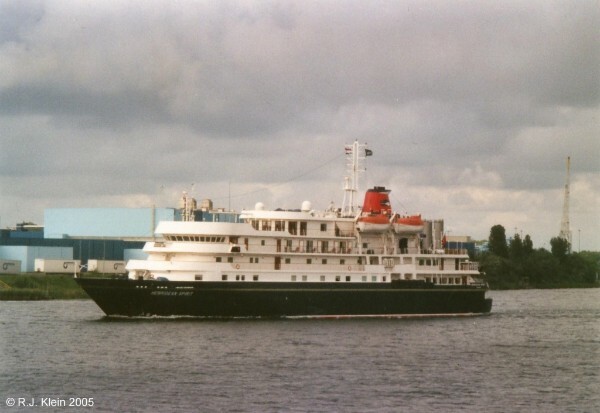 Hebridean Spirit had been sold to the British based company Noble Caledonia and she was renamed Caledonian Sky. For Noble Caledonia, the ship started her sailings in may of 2012, meeting her sister Island Sky, that had been built as Renaissance VIII in 1992.